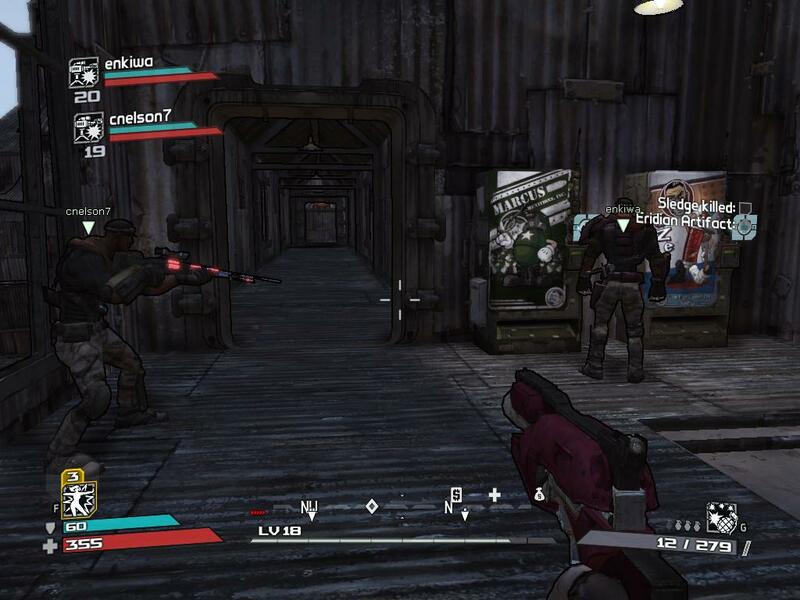 So Borderlands came out yesterday, and I’ve been playing it madly– last night in single-player, tonight mostly in co-op. Co-op allows up to 4 players, and it’s a lot of fun– it’s nowhere near as hard as Left 4 Dead, so you mostly run around finding things to shoot and loot. The quests can be a bit confusing in multi-player… if you return to single-player, you keep loot and skills you acquired in co-op, but also quest progress, which is good and bad. It’s nice that you don’t have to repeat, but it can mean that you run quests out of order and in a bit of a rush. You can play with people of different levels, which is nice. They’ve come up with an interesting rendering scheme that puts black outlines round anything above a certain size. It’s pretty and distinctive, and makes the game look like European comics. In general it feels a lot like a four-player Fallout 3. The world looks and feels similar. There’s no save-the-world plot though; instead you’re basically a scavenger/mercenary, and the plot revolves around the ultimate haul: finding advanced alien technology. It’s kind of refreshing not being the Chosen One of Legend, but rather an honest rogue with an itchy trigger finger. There are four playable classes; you can have any mixture in a group. I’ve been playing Lilith so far; she gets to be quite a lot of fun once she starts doing mega-damage with her Phase Walk. On the whole the UI is good– you don’t have to read the manual or find walkthroughs. There are minor annoyances with loot gathering– it’d be nice if ammo you can’t pick up was highlighted in a different color. And major annoyances with the friends system; it’s not integrated with Steam, it’s not easy to get groups of friends together, voice is a bit wonky (to solve those issues my gaming group has been using Steam to hustle up players and set up voice chat), and to host a game you have to use a highly arcane process.